One of the things that most grandparents share is an unconditional love for their grandchildren. 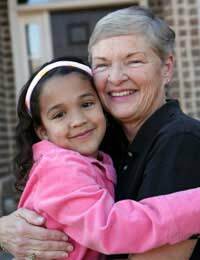 Whether the children come into the lives of their grandparents as infants or as is often the case for step-grandchildren, older kids, it usually takes very little time for the children to win a permanent place in the hearts of their grandparents. No matter the type of the relationship, it takes time and effort for people to get to know one another well enough to form true connections. Step-grandparents can hasten the process of bonding with their step-grandchildren by taking the time to talk to each of the children, asking about their interests and inviting them to join in on family events, both everyday and special occasion. If the grandparents already have other grandchildren, they may wish to encourage those kids to help the new additions to feel welcomed and included. Every opportunity that step-grandchildren have to join in with family members gives them the chance to develop lasting bonds. When step-grandchildren first join a family, they are sure to feel a bit out of sorts, wondering bow they will fit in with the rest of the group. Grandparents who live near their step-grandkids can invite the children to their homes for visits and meals, and may even want to introduce the kids to their hobbies, hoping that they will develop shared interests. For grandparents who live further away, phone calls and email correspondence can help the generations to feel connected to one another. In today’s technologically advanced world, people can develop and maintain genuine bonds, even when they are separated by mountains and oceans. Sometimes, when step-grandchildren join a family, grandparents notice that their other grandchildren seem jealous, worried that the newcomers are intruding on their territory. Grandparents know that they have ample love for all of their grandchildren, but the kids can benefit from a bit of reassurance. Just as the natural grandchildren may feel jealousy toward the newer step-grandkids, the step-grandchildren may have reservations about the idea that they will be able to hold the same special place in the hearts of the grandparents as the other kids do. Grandparents can show all of their grandkids that they are loved and appreciated by treating them equally – spending time with each and when gift-giving occasions arise, choosing comparable items for all of the children. Families are bonded by far more than DNA. The most important things that families share have nothing to do with genetics, but everything to do with love, respect, and a dedication to one another. Grandparents often set the example in their families for younger generations, so when they display attitudes of acceptance and warmth, the others are likely to follow suit. By making it clear that they are open to welcoming their step-grandchildren into their lives and hearts, grandparents can help to create a family atmosphere that is kind and nurturing, the best possible environment for raising children.